American higher education is regarded as part of that “shining city upon a hill” as expressed by President Ronald Reagan in his farewell address. Long considered the gold standard of opportunity, students from across the globe yearn to study at U.S. institutions of higher learning. While 1.2 million international students enroll in U.S. colleges and universities, and with them billions of tuition dollars still flow to America’s shores, a new reality is taking hold, and with it, a bit less glare from that shining city. 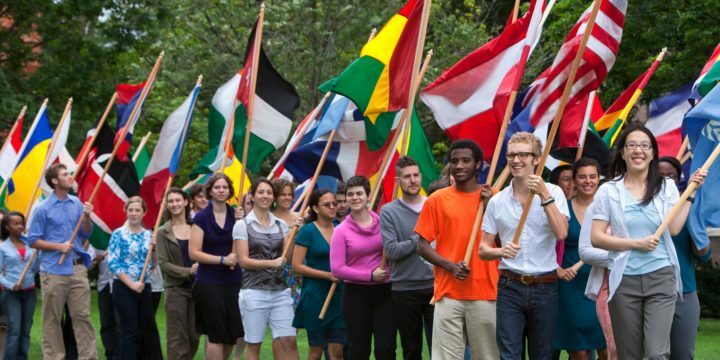 By now, the numbers for international graduate enrollment are beginning to sink in. The Council of Graduate Schools reports that applications from students abroad declined for the second year in a row. Particularly alarming, long-time consumers of U.S. graduate education — South Korea, India and Saudi Arabia — are included in this shortfall in international graduate enrollment. In their 2018 Survey of Admissions Leaders, Inside Higher Ed showed that 74% of respondents believe the tone of the current administration is responsible for sending an unwelcoming message to those who are considering the U.S. as their education destination. Additionally, policies making student visa issuance more daunting, like the recent report that the administration is considering increased vetting of Chinese students to protect against espionage, are prompting these students to consider alternative options. Moreover, the news coverage of mass shootings brings safety considerations that until recently weren’t much of a factor as to whether someone would pursue graduate study in the United States. The response by American colleges and universities to protect against international graduate enrollment declines has been both concerted and unique. Hundreds of institutions have joined the #YouAreWelcomeHere campaign that provides for a coordinated message of belonging for prospective international students. On the more unique end of the spectrum, the University of Illinois at Urbana-Champaign just made public their $60 million insurance policy to safeguard against an event leading to a 20% or higher decrease in tuition revenue from Chinese students. Perhaps the first of its kind, this nearly half-million dollar policy is an example of the concern around the international graduate enrollment decline. The university credits Chinese students for one-fifth of their Gies College of Business tuition revenue. While the news isn’t necessarily encouraging, there are a number of things institutions can do to protect themselves from declining international interest that do not require relying on our good neighbor, State Farm. There is so much positivity to communicate about graduate study in the U.S.: faculty accomplishments and scholarship, the rewarding experiences of current students, the scholarly contributions of our graduate research assistants, and the outcomes represented in our international student graduates. Yet these messages alone are insufficient. International students must understand two critical items. First, they are welcome on your campus. Second, they are safe on your campus. Capture Higher Ed is helping institutions communicate these messages via the use of Capture Behavioral Engagement (CBE), proprietary software that provides for dynamic content and marketing automation. CBE can detect when graduate program pages on a college website are being viewed by an IP address or personal display device outside the United States. Rulesets are then strategically deployed to trigger content focused on delivering the message that international students are welcome to be part of a safe, academically rewarding institution where international students thrive. CBE has 14 unique options when delivering this content from triggered emails to website popovers to website image swaps depicting college international students enjoying their academic and community experiences. Additionally, CBE is able to capture the prospective student information of these website visitors via the deployment of automated Progressive Identification Forms. These forms provide colleges and universities a rich source of high performing, international leads with whom graduate recruitment teams can communicate. As a former staffer for the U.S. House of Representatives, I have witnessed firsthand the good that comes with policies promoting access to American higher education. As a member of university communities for the better part of two decades, I have experienced the value international students create in the classroom, the positive relationships they have forged on our campuses, and the growth experienced from the education they have received. These are messages worth communicating, stories worth telling. I am so pleased to work for a company, Capture Higher Ed, that provides innovative solutions in order to genuinely communicate that #YouAreWelcomeHere.